The Big Idea: As children grow and their brains develop, their styles of play change too. Solitary Play: This type of play is commonly seen in babies. They tend to play on their own, exploring anything and everything they can get their hands on, including their own body parts! You might see a baby get great giggles out of grabbing his foot or putting his hand in his mouth! While babies may play simple games like peek-a-boo with grown-ups, they don’t yet have the social skills or focus to play directly with other children and babies. Parallel Play: As kids get a bit older (ages 2–3), they become interested in being around their peers. However, they haven’t yet honed the important social skills of sharing and turn taking that are necessary to play directly with others. At this age, kids are likely to play in parallel (side by side), with separate toys or objects. Even though kids playing in parallel may not interact, you might notice them observing one another and mimicking ways in which the other is playing. Group Play: By the time kids enter school, they often play together in groups. 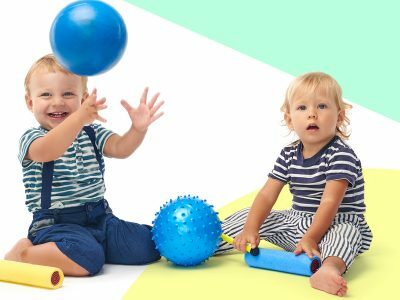 You might see them sharing and taking turns playing with the same toys, doing dramatic or pretend play around a theme, or playing group games like duck, duck, goose or hide-and-seek. Playing together in groups can help kids improve their social and cognitive skills as they plan out play scenarios, switch roles, and solve problems together creatively.